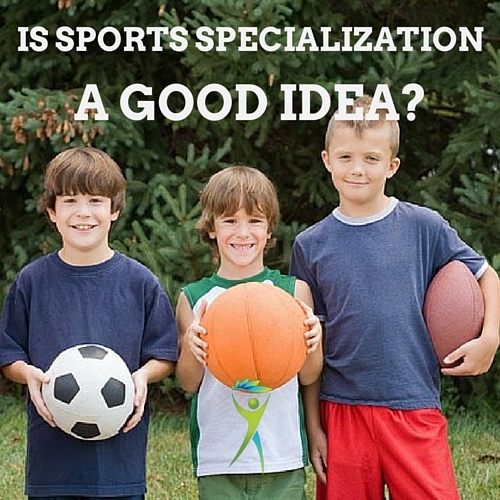 Home » Hip Pain in Children: Is Sports Specialization a Good Idea? It’s not often that jaw-dropping research comes along. And when it pertains to the health of children, usually parents listen. If hip pain in children is something that is on your radar, pay attention. That’s about 200 – 800% more likely to build an early form of osteoarthritis in the hip. A CAM or pincer deformity is bone overgrowth on the neck of the femur or pelvis, respectively. They limit range of motion, cause cartilage damage, + lead to early/severe degeneration of the hip joint. Observe what each deformity looks like below. This occurs due to load on growth plate of the femoral neck (which fuses around 18 years of age) of the hip with high stress sports. I believe it’s safe to extrapolate the conclusion of this research to females + to other high volume running sports such as field-hockey or lacrosse. The above conditions can create chronic (lasting more than 3 months), constant (experienced 100% of the day from sunrise to sunset) in a young adult and most definitely in a 50 or 60 year-old. They also lead to more significant traumas such as falls as an older person or hip replacements, which put a permanent cap on the amount of activity an individual can do. Do you want your 14 year-old to excel at his/her sport + get a scholarship into college? Or do you want him/her to have a pain-free, active lifestyle as a grandparent? What should you do to prevent hip pain in children from leading into hip pain in adults? Single-sport year-round activity that is high load for an adolescent is a big mistake. When children specialize later, their bodies last longer. Do not let your children specialize in sports early. Take 2 minutes to perform the the thigh to chest test with no equipment on your kids. Consult with a reputable musculoskeletal provider when it comes to your child’s pain, fitness, and health. Orthopedic doctors, adhesion-based specialists, and sports-specific strength coaches can all be of value. What are your child’s thigh to chest test numbers? Please share if you’re comfortable sharing.